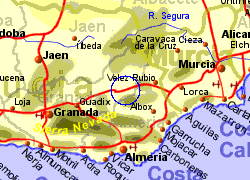 The village of Cullar lies just north of the Puerto Lumbreras to Granada motorway, between Baza and Velez Rubio, in the province of Granada. This is a predominantly agricultural area growing cereals and vegetables,at an altitude of around 900m (3000ft), approximately 35Km west of the Sierra de Maria which rise to just over 2000m. The 15Km long Negratin Lake lies 20Km to the west. 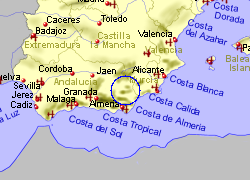 The history of Cullar dates back to prehistoric times, as has been evidenced by many archaeological finds in the area. 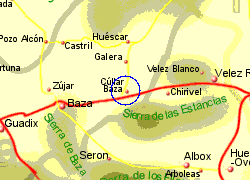 Map of the Cullar area.